DUE TO A SUPPLIER ISSUE WE ARE NOT ABLE TO PROVIDE SPEAKERS AT THIS TIME. WE APOLOGIZE AND THANK-YOU FOR VISITING Sounds Sweet. UNCOMPROMISED SPEAKERS for Amateur Radio, 2-Way Radio, Shortwave and Scanner listening. UNCOMPROMISED communication voice and shortwave music speakers with FULL CLEAR CLEAN audio and NO HISS! Dense, solid, tongue and groove construction, tuned port, bass reflex speakers optimized for communications, scanners and shortwave with an EXTREMELY EFFICIENT dual cone driver. Sounds Sweet speakers can be driven LOUD WITH ALL RADIOS, even handheld transceivers and scanners! Sounds Sweet speakers IMPROVE ALL EXISTING RADIOS AND SCANNERS. Read the 67 eHam.net reviews that rate us 5 out of 5!! Sounds Sweet communications speakers maximize intelligibility from your transceiver, receiver or portable by reproducing only the communications voice and shortwave music frequencies coming from your SSB, AM or FM communication or shortwave radio. Sounds Sweet speakers have the useful and satisfying bass information missing from smaller communications and built-in radio speakers without the hiss and mud produced by speakers not intended for communications voice and shortwave music use. The dual cone driver combines a solid and rich sounding eight inch cone with an integral second cone for bright clean highs. The result Sounds Sweet! Sounds Sweet communications speakers let you DIG OUT the weak signals and really ENJOY the strong ones! Sounds Sweet communications voice and shortwave music speakers are big and solid. The cabinets are tongue and groove constructed of 3/4" MDF weighing in at 13 lbs! They are intended for base station use with their 12" high x 10" wide x 10" deep footprint. These are NOT cheaply made, tinny sounding lightweights. Sounds Sweet speakers make listening a pleasure. Amplified speakers can be prone to picking up your transmitter's energy resulting in distorted feedback at the time that you want the speaker to be quiet. Passive electrical design minimizes this Radio Frequency Interference (RFI). Sounds Sweet speakers are intended to be used with no extra amplification. These speakers will work fine directly wired to any external speaker or headphone connector on your radio. Your transceiver, receiver or even your walkie-talkie or portable scanner has more than enough output to readily power a Sounds Sweet communications speaker. Sounds Sweet speakers can be driven loud from all radios! 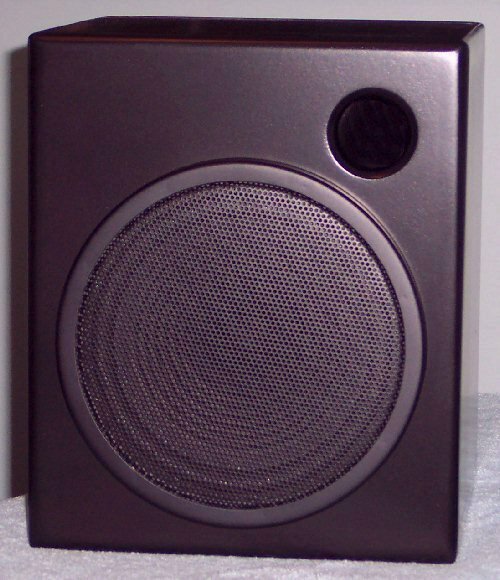 Built in radio speakers and other speakers that call themselves "communications" speakers are notoriously tinny. Sounds Sweet speakers use solid 3/4" MDF with tongue and groove construction. This together with the tuned port and specialized dual cone acoustic suspension driver produce bass response to the lower end of human voice and no lower. Our speakers produce the bass energy you need to hear and understand even the weakest and noisiest of signals without the muddiness that hi-fi speakers, with extended bass response for musical instruments can add. Correctly tuned bass response adds to intelligibility! In the search for clearer and more intelligible sound than the speakers built in to radios can provide many have tried headphones, some have tried hi-fi or even computer speakers. These options are always a compromise because their tweeters are designed for higher frequencies than are present in the voice audio energy coming from your radio. Fatiguing transistor thermal noise and vacuum tube hiss are eliminated in the Sounds Sweet design and it is done without unnecessary equalizers and active stages. Sounds Sweet speakers are assembled and finished in the U.S.A. Sounds Sweet speaker cabinets are manufactured in the U.S.A. out of U.S. produced fiberboard, sealants, dampening materials, fasteners and finishes and packaged in U.S. produced packaging. Sounds Sweet is a registered trademark. All copyrighted, trademarked or servicemarked items are copyrighted, trademarked or servicemarked by the corporation, company, organization, entity or individual holding the copyright, trademark or servicemark.